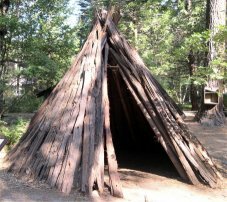 Bark-covered homes were used by Miwok people living in Yosemite Valley. Built on a framework of pine or incense cedar poles lashed with grapevines, they were long-lasting. Today many people think of them as the only kind of Miwok house, but this was not the case. Only brush-covered, dome-shaped dwellings appear in the earliest-known photographs of Miwok people. When bark-covered structures are first evident in photos of Yosemite, they were simple shelters which provided protection from summer sun and thunderstorms rather than for year-round use. The construction of a incense cedar-bark home required a number of old-growth incense cedar trees which had been dead for at least two years (allowing the bark to loosen). Incense cedar bark was easier to obtain after the start of Euro-American lumbering operations. Most photographs of Miwok bark homes taken at the turn of the century show commercial lumber also used in the houses' construction. When the materials were readily available, bark homes were relatively easy to build and lasted a number of years. It is more difficult to make brush shelters that effectively shed rain and snow, and they frequently need re-building.